Home page → Computing → Tutorials → Facing – The server encountered an internal error! Solved here. The other day we got our site with tones of unverified and broken links. 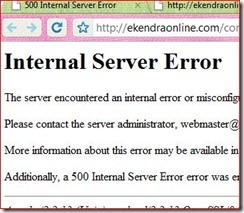 Joomla, the award winning open-source CMS, was the web software of choice for our main site www.ekendraonline.com. We have been using sh404SEF- editor’s choice and the most popular one until recently. It is a business, the Joomla component that used to generate search engine friendly urls and was the free, all of sudden the genius guys or the makers of sh404SEF turned out to go business, the component was charged 35$ for a single access for a year. So, we decided to drop out sh404SEF and suggest those conscious people like us NOT to use sh404SEF simply because there are several other free Joomla components for generating Search Engine Friendly URLs. The Internal Server Error we received, by chance, happened to be after the case of sh404 above. But might not be the one due to that component. Below is the exact copy of what is displayed on our website pages. 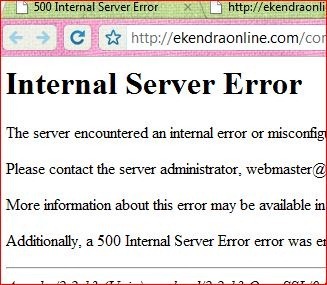 Please contact the server administrator, [email protected]ekendraonline.com and inform them of the time the error occurred, and anything you might have done that may have caused the error. The first thing you need to fix or check if 500 Internal Server Error can be handled is to rename the server configuration file htaccess.txt to .htaccess only (simply right click the file htaccess.txt to rename and modify to .htaccess) in the file manager of the cPanel (we guess). The problem is most likely to be an issue with DOS carriage returns / line feeds versus what the Linux server expected. There are various tools create .htaccess files online, but generally notepad or any text editor will do the work. Ensure to test your site thoroughly after making an adjustments to the .htaccess file. And remember to hackup the file htaccess.txt before acting.